Dry eye syndrome is frequent problems populace face in their life. Majority of people suffer from dry eyes. 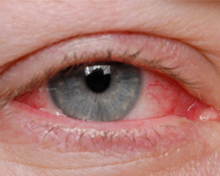 Dry eye syndrome is a continual lack of sufficient lubrication and moisture in the eye. 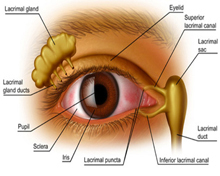 Its effects range from subtle but constant irritation to ocular inflammation of the anterior (front) tissues of the eye. Parkinson's medications and birth control pills or because people live in a dry, dusty or windy climate. If the workplace or home is air conditioned or a dry heating system, there are more chances of having dry eyes. Another cause is inadequate blinking. It can happen when people are working on computer screen all day. This disease is more widespread in women, who tend to have drier skin then men. The oil deficit also affects the tear film. Without as much oil to seal the watery layer, the tear film evaporates much faster, leaving dry areas on the cornea. Numerous factors, such as hot, dry or windy climates, high altitudes, air-conditioning and cigarette smoke also trigger dry eyes. Many people feel their eyes are troubling when reading or working on a computer for long time. If eyes are irritating, person must stop activities that cause trouble which will definitely keeps the eyes more relaxed. People who use contact lens regularly are also at greater risk of dryness because the contacts absorb the tear film, causing proteins to form on the surface of the lens. Certain medications, thyroid conditions, vitamin A deficiency can also cause dryness. Incomplete closure of the eyelids, eyelid disease and a deficiency of the tear-producing glands are other causes of dry eye syndrome. Women experience problems with dry eyes more frequently because they enter menopause due to hormonal changes. Major symptoms include: itching, burning, irritation, redness, blurred vision that improves with blinking, excessive tearing, increased discomfort after periods of reading, watching TV, or working on a computer. Some people also experience a foreign body sensation, the feeling that something is in the eye. Sometimes watery eyes can result from dry eye syndrome, because the excessive dryness works to over stimulate production of the watery component of eye's tears. High-risk factors for chronic Dry Eye are hormonal changes which are related to aging and menopause, any medical conditions such as diabetes and autoimmune disease for example Sjogren's syndrome. Dry eyes are also a symptom of general diseases such as lupus, rheumatoid arthritis, rosacea. Diagnosis must be done by experienced eye specialist. There are several methods to test for dry eyes. The doctor will first find out the original cause by measuring the production, evaporation rate and quality of the tear film. Special drops that highlight problems that would be otherwise invisible are particularly helpful to diagnose the presence and extent of the dryness. 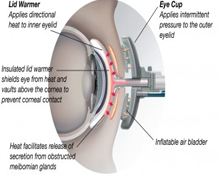 Treatment procedure for dry eyes varies from person to person. Many people get relief simply from using artificial tears on a regular basis. Some of these products are watery and lessen the symptoms temporarily. Others are thicker and adhere to the eye longer. Doctors recommend preservative-free tears because they are the most comforting and have fewer additives that could potentially irritate. The special instruction from doctors is that people must avoid products that whiten the eyes because they don't have sufficient lubricating qualities and often make the problem worse. Another option is closing the opening of the tear drain in the eyelid with special inserts. This works like closing a sink drain with a stopper. These special plugs trap the tears on the eye, keeping it moist. This may be done on a momentary basis with a dissolvable collagen plug, or permanently with a silicone plug. People suffering from dry eye syndrome must change their lifestyle slightly that can considerably recover irritation from dry eyes. They must drink eight to ten glasses of water each day to keeps the body hydrated and flushes impurities. Patient may put great effort to blink frequently especially when reading or watching television. He must not rub the eyes. This will deteriorate the irritation. It is necessary to treat dry eye problems as early as possible. Treatment is not just for comfort, but also for the health of the cornea. Sometimes people use the eye drops that lessen redness to treat their dry eyes. But this will not solve the problem of dry eyes unless the eye drops also contain artificial tears. These drops can decrease or get rid of the redness momentarily but do not cure the cause of the redness, whether it's dryness, environmental irritation or some other problem. If a person wears contact lenses, he must be conscious that many eye drops, especially artificial tears, cannot be used while his contacts are in eyes. He will need to remove them before using drops and wait 15 minutes or even longer before reinserting the lenses. If eye dryness is mild, then contact lens rewetting drops may be sufficient to make eyes feel better, but the effect is generally only temporary. If the problem is environmental, person should always wear sunglasses when going outside to lessen exposure to sun, wind and dust. When person stays inside the house, an air cleaner can filter out dust and other particles from the air, while a humidifier adds moisture to air that is too dry because of air conditioning or heating. Patient must take care of simple things to feel comfortable and reduce problem of eye dryness. It is advised to avoid direct air currents. He must not directly use hair dryers, car heaters, or fans toward eyes. They must wear protective glasses while going out. Use home humidifiers to get relief. In winter, a humidifier can add moisture to dry indoor air. Some people use specially designed glasses that form a moisture chamber around the eye, creating additional humidity. According to doctors, this eye disorder is gaining epidemic proportions in India. The major cause is mainly staring at computer screens for long periods of time without blinking. If patient taking some precaution advised by doctors, his life will be more contented.